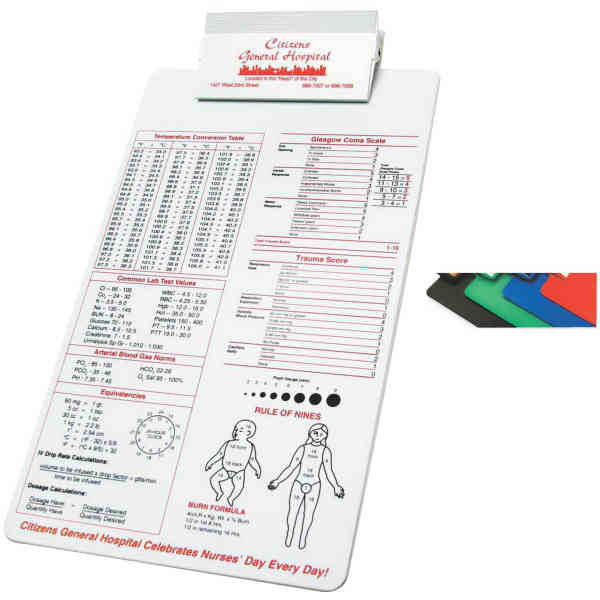 Legalmaster Clipboard, satin polystyrene legal size board with satin polystyrene clip. Clipboard features a write-on surface that accepts wet erase pens. Standard clip is rectangular, but contour and oval style clips are also available at no additional cost. Every clip has two stainless steel springs for a higher quality product. Made in the U.S.A. Item Colors are White, Yellow, Recycled Off-White, 293 Blue, Black and 348 Green (Board only), Clear acrylic stock. Size: 9 " x 16 1/2 "
Price Includes:one color imprint on clip only. Price Includes: Per imprint color, per location. Price Includes: Text under 9 pt. Price Includes: per color, per side. Each additional imprint color on clip.